Whisk together the hot water and bouillon base. Melt butter in a skillet and saute onion until tender. Stir in flour until golden. Gradually add 1 cup of the broth. Add the remaining broth and blend well. Add in the bacon, potatoes, salt, pepper, basil and thyme. Cook on low 6-8 hours or until potatoes are tender. Stir in heavy and sour cream and heat through. Garnish each bowl with green onions and cheese. 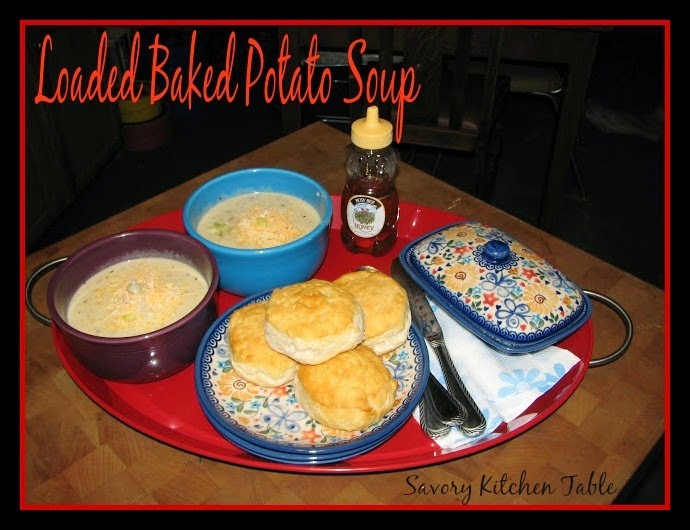 Serve with buttermilk biscuits and maple honey. Spray an 8 inch cake pan with PURE. Sift together the 1 cup of the flour, cake flour, salt, baking powder and soda. In a mixing bowl add the remaining 1/2 cup flour. Drop the dough 1/4 cup at a time into the flour. Arrange all the balls in the pan. Beat egg with water. Brush tops of dough. To make this ahead of time do all steps except the buttermilk, cover and refrigerate until needed. Top with another sheet of wax paper. Press into a 1/4 inch thickness and freeze for 10 minutes. Using a rolling pin roll smooth. Remove top sheet of wax paper and sprinkle with brown sugar. Using small cutouts, cut butter into desired shapes. These can be made ahead of time and frozen. One of our favorite winter meals.